American Girls in Moscow: A Big Hearty Welcome to COOK HOUSE! A Big Hearty Welcome to COOK HOUSE! Their flagship 2-level store is in the Kapitolii Shopping Mall, Prospect Vernadskova, at metro Universityet. They have another location in the Zolotoy Vavilon Rostokino Mall, Prospect Mira, at metro VDNKh. They sell all kinds of cooking gadgets, cookware and dining ware, along with linens and cook books. Brands include Emile Henry, Jamie Oliver, Bodum, & Webber. They don't sell any rare ingredients (no vanilla bean extract, for example), but they do have other items from America that I've never been able to find here: Wilton's gel food coloring; supplies for cake decorating and fondant; various sizes of cupcake liners; great spatulas... LOTS of silicone baking molds, too. They even have cake carriers and racks for drying homemade pasta—the same model I got in a small shop in Rome! 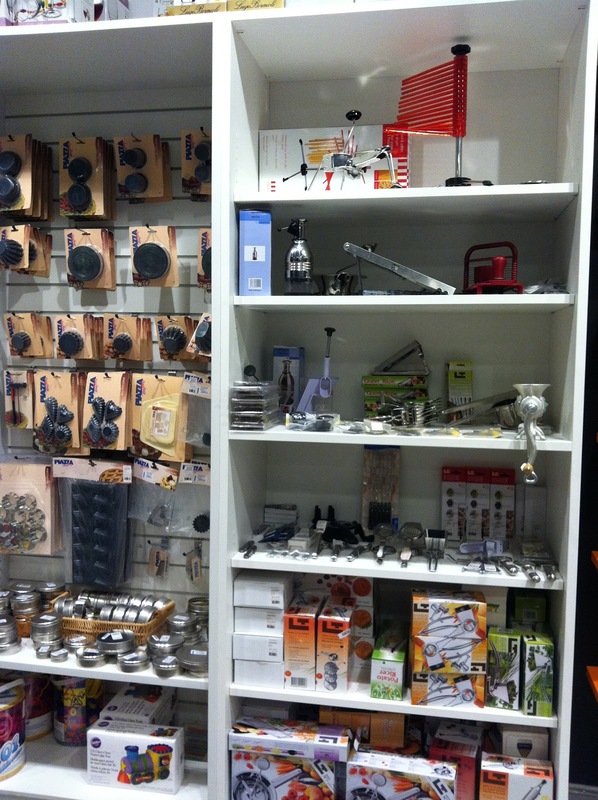 It's great that they have the pasta rack (see top shelf) and MANY accessories for making ravioli—but they don't have the hand-crank pasta maker you really need in order to use all these other items. I pointed this out and the clerk was thankful for the suggestion. I must say that the staff there was very kind, and the woman I spoke with still seemed to be blown away by everything in the store; until she had started working there, it would never have even occurred to her that many of the items they sell could even exist. She has been having fun discovering uses for everything! You can also attend cooking classes there, lead by chefs who focus on various themes (for this month) such as: Soups and Stocks; French Cooking; Cooking for Little Ones; Meat & Game; Halloween; Italian Food... They do adult and child parties, too. Whoever planned this store was spot-on; this niche was completely untapped until now. 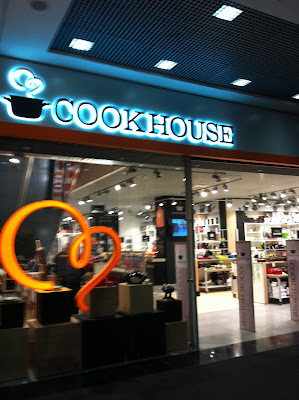 Their website is: cookhouse.ru, and you can email them for more information at: cook@cookhouse.ru. Phone number: 8.800.100.05.04. Interesting that it's signage is in English. The brand seems only to be in Russia. Yes! I was in this store last week! I was so excited to see Wilton....if I should ever need it. Felt like a piece of home! We must run into each other soon! What bliss!! I haven't been yet, but your wonderful piece makes me feel I should get it in the diary! Was just at the Kapitoly location because I need things to make a weddding cake. They had absolutely nothing that I needed. 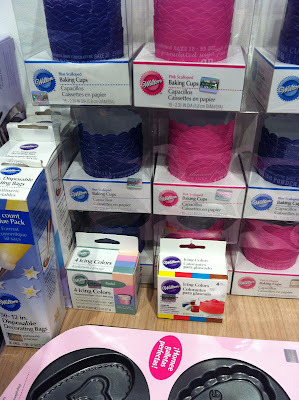 No cake boards, 12" pans, fondant, cupcake liners, nor gel foos color. It was a complete bust of a trip. 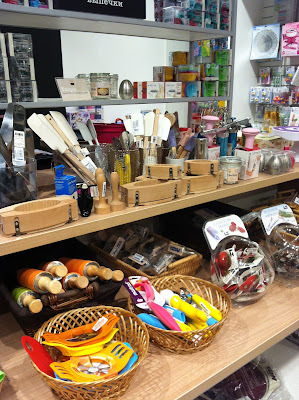 Little store out at Hobby Gorod around Cherkisovskaya a MUCH better option for bakers looking for Wilton products. Oh, Abby!!!! I'm so sorry! I know what you mean; I've been there quite a few times and they've been out of what I needed, too... It gets so frustrating some times! I have 12" pans, cupcake liners and gel food coloring if you'd like to borrow mine. I've also made fondant off of recipes on the internet... Email me at aginmoscow@gmail.com, OK?